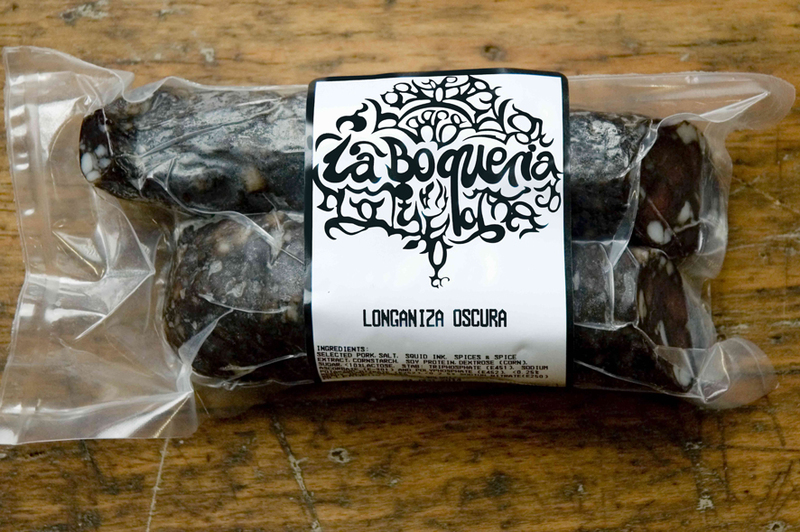 Longaniza Oscura One of the most popular small-goods in Spain is reincarnated in Barcelona and brought back to Australia. This iconic embutido made from Australian pork leg and back-fat is now deeply coloured and gently flavoured with squid ink. Product notes Conventional Longaniza Oscura -Thickly sliced, served in a mix charcuteria plate or on its own, with pickled guindilla chillies Tasting Notes VISUAL • Vivid marble colours • Firm and smooth skin profile. TEXTURE • Firm texture, best when sliced medium thick • Burst undertooth of sweet backfat FLAVOUR • Balanced towards sweet rather than savoury with subtle herb and strong back-fat • Long-lasting and subtle sweet porky notes developing into a salty end note.